Civil war rages in Russia. In Siberia the counter-revolutionary forces of Admiral Kolchak have stormed Perm and are threatening to advance westwards. Elsewhere though the tide may be turning in the Bolsheviks‘ favour, as the increasingly powerful Red Army exploits the disorganisation and lack of unity among the Bolsheviks’ enemies. The Treaty of Brest-Litovsk obliged the Bolsheviks to abandon vast territories in the west of the former Russian Empire. That treaty has however been rendered null and void by the German armistice with the western Allies. Now the Red Army is expanding into Ukraine and the Baltic States, keen to bring them back into the Russian orbit and introduce them to the delights of socialism. 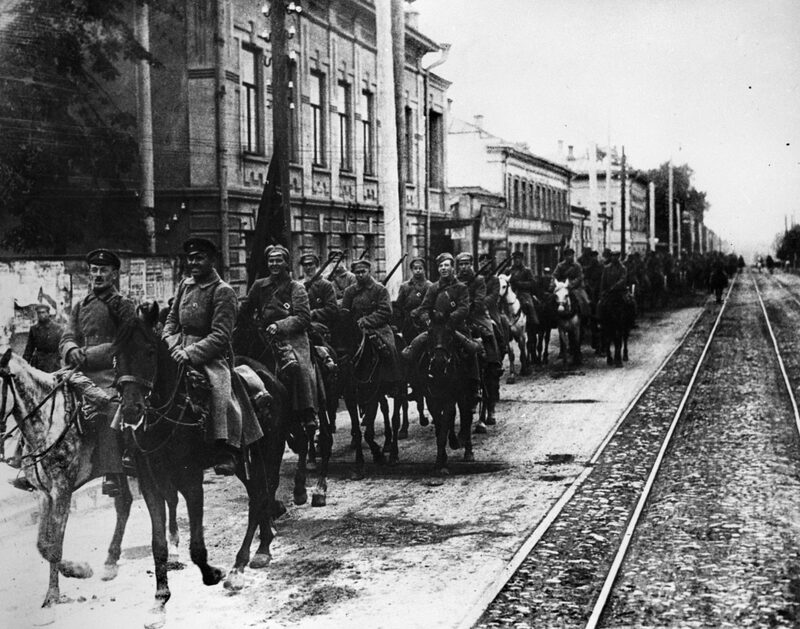 The Bolsheviks have captured Riga, Latvia’s capital, and have also taken Vilna (or Vilnius), which is separately disputed between Poland and Lithuania. Fearing that the Red Army is about to snuff out their recently achieved independence, the leaders of Latvia now take a desperate step: they advertise in Germany for volunteers to come and aid them in their struggle against the Red Army. The Latvians hope that there are enough demobilised soldiers in Germany who miss the comradeship and certainties of army life, and that these men will be keen to join their struggle against Bolshevism. Whether these German volunteers will be an easily controllable force is of course another matter, but Latvia’s desperate situation obliges its leaders to offer what may prove to be a faustian pact. Peace is descending on Western Europe but in Russia the civil war between the Bolsheviks and their opponents continues. The terms of the Western Front armistice oblige the Germans to abandon the gains of the Brest-Litovsk treaty, so now German and Austro-Hungarian troops are withdrawing from Ukraine, forcing the client regime there to stand on its own two feet and face off a likely Red Army invasion. Meanwhile the Germans are also withdrawing from the Baltic states of Estonia, Latvia and Lithuania, where liberal nationalists are now establishing independent administrations. The anti-Bolshevik forces within Russia itself hope that the armistice means that they will receive more assistance from the Allies, who have promised the Whites that Russian military stores captured by the Germans will be shipped to them; there is even talk of sending troops to occupy Ukraine. For now though the military situation remains confusing. Baron Wrangel is leading a White army in the northern Caucasus and is successfully clearing the Red Army and Bolsheviks from there. Elsewhere though the Red Army seems to be getting stronger and stronger and is no longer the ineffectual rabble it once was. The White are also suffering from the increased lack of interest by the Czechoslovak Legion in the Russian Civil War; the emerging independence of Czechoslovakia means that the Czechoslovaks do not see why they should remain in Russia any longer. In southern Russia Denikin is the preeminent leader of White forces, particularly since the recent death by heart attack of Alexeev. In Siberia the situation is more complicated. The Komuch had attempted to establish a liberal and socialist regime but never attracted much popular support and increasingly became puppets of more reactionary military figures; the Komuch also finds itself consumed by infighting between different factions. Now the pretence of democracy is abandoned and a purely military regime is established under Alexander Kolchak, previously the commander of Russia’s Black Sea fleet. In Siberia the leftist government of the Komuch (the Committee of Members of the Constituent Assembly) attempted to present itself as a progressive alternative to the Bolshevik dictatorship (as opposed to conservative figures like Denikin and Kornilov). Soon after the Komuch formed an alliance with the Czechoslovak Legion, which took control of the Trans-Siberian Railway and carved out an impressive swathe of territory they then placed under the Komuch’s notional control. An early acquisition by the Legion was the city of Samara, which the Komuch then made its capital. Now though the Czechoslovaks’ power is eroding; many of their soldiers have become demoralised and are wondering why they are fighting against the Bolsheviks instead of returning to Western Europe to fight for the creation of independent Czechoslovakia. The Red Army meanwhile is becoming ever more powerful. They have already recovered Simbirsk, birthplace of Lenin, and now they chase the Komuch from Samara itself. The Komuch retreat to Ufa to lick their wounds, but here they find themselves falling under the influence of more reactionary forces of the White Russian counter-revolution. The Komuch never managed to establish much of a popular following for itself. Now it appears that its attempt to present itself as a progressive rallying point for opposition to the Bolsheviks appears to have failed. Bolshevik rule in Russia has many enemies. Within the Bolshevik-controlled zone there are malcontents plotting against Soviet rule; these are being dealt with by the Cheka. Elsewhere the Bolsheviks’ enemies are a matter for the Red Army. And there are many of these enemies. Denikin‘s army is on the loose in the south while the Komuch government in Siberia is presenting itself as the true government of Russia. Foreign armies have also started inviting themselves into the country, with Japanese and American troops landing in Vladivostok while British-led forces have landed in Murmansk and Archangelsk, bringing influenza with them. One of the most effective forces in the field against the Bolsheviks is the Czechoslovak Legion, made up of Czechs and Slovaks who had been serving in the Tsar’s army and are now seeking their homeland’s independence from Austria-Hungary. Heavily armed and highly motivated, the Czechoslovaks triumphed over the Bolsheviks earlier in the summer. Now though the dominance of the Legion is eroding. Thanks to the organising work of Trotsky, the Red Army is now a more effective opponent. The Czechoslovaks meanwhile are becoming demoralised, fearing that they are doomed to fight endlessly in Russia when their real interest is in returning to Europe to fight for their homeland. For the last few days the Red Army has been battling elements of the Czechoslovak Legion and Komuch forces defending Kazan. Today the Red Army successfully storms the city, driving away their enemies. With a separate Red Army column preparing to recapture Simbirsk (birthplace of Lenin), it looks like the tide of battle may now be turning against the Komuch and its Czechoslovak allies.